We are Rubber Stamp Manufacturers and General Printers based in Portsmouth, Hampshire, UK. We offer a fast, efficient service on all types of rubber stamps, from traditional business or company rubber stamps for use with a separate ink pad to self-inking steel framed daters and numberers with additional custom text or graphics. On each page of our site you will find a list of prices, sizes and other information. In addition you will find links to download .pdf sample pages which can be printed to show the actual sizes of each type of stamp. We hope you find the site useful, if you wish to place an order you can find contact details on our contacts page. • The ultimate in flexibility. • Great for surfaces where special inks are required. • Integral, replaceable ink pad. • Clean and easy to use or store. • Ideal for your desk, van or pocket. • Available with adjustable date or number. • Steel frame for strength. • Ideal for the Heavy Duty user. 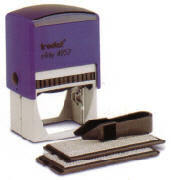 • Available as standard or self inking. • With or without custom die. • many combinations of date, number or message. • Pads come in many sizes and colours. • Inks are available for use on almost any surface.